Centrally located in downtown Jodhpur, Jodhana Elite is 2.5 km from Ummaid Bhawan Palace. It offers a rooftop restaurant and air-conditioned rooms with a flat-screen TV. Free Wi-Fi and parking are provided. Elite Jodhana is a 5-minute drive from Jodhpur Airport and a 10-minute drive from Jodhpur Railway Station. It is 4.3 km from the Clock Tower and 5 km from Mehrangarh Fort. Cosy rooms feature modern interiors with soothing wall colours and lightwood furnishings. They are well equipped with a seating area, minibar and an attached bathroom. Guests enjoy fantastic views of Jodhpur at the rooftop Jalsa Restaurant. Traditional Rajasthani and Indian dishes are offered. For convenience, the property provides concierge and ticketing services. Staff at the 24-hour reception can attend to guests’ requests. Free! All children under 7 years stay free of charge when using existing beds. One child under 2 years is charged INR 450 per night and person in a child's cot/crib. 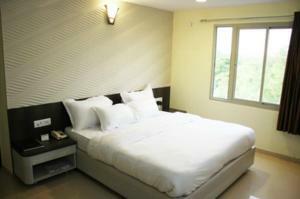 One older child or adult is charged INR 950 per night and person in an extra bed. Maximum capacity of extra beds/children's cots in a room is 1. Any type of extra bed or child's cot/crib is upon request and needs to be confirmed by the hotel. Supplements will not be calculated automatically in the total costs and have to be paid separately in the hotel.